Wilson Fisk (Vincent D’Onofrio), better known in comic book lore as the Kingpin, is not really that much like Donald Trump in general. He’s a lot more cold and calculating, for one thing — it’s largely his brains that make his criminal empire work, whereas few would say that Trump is the kind of guy who does plans in any normal sense. And for the most part, in Season 3 of Marvel’s “Daredevil” on Netflix, Fisk is content to work largely behind the scenes doing fun and horrifying machinations, staying several steps ahead of Daredevil (Charlie Cox), Foggy Nelson (Elden Henson) and Karen Page (Deborah Ann Woll) for almost the entire season, easily countering every move they make without taking any public action. But in the eleventh episode of season 3 he finally takes center stage and delivers a speech that you could very easily believe was written by Trump’s team. 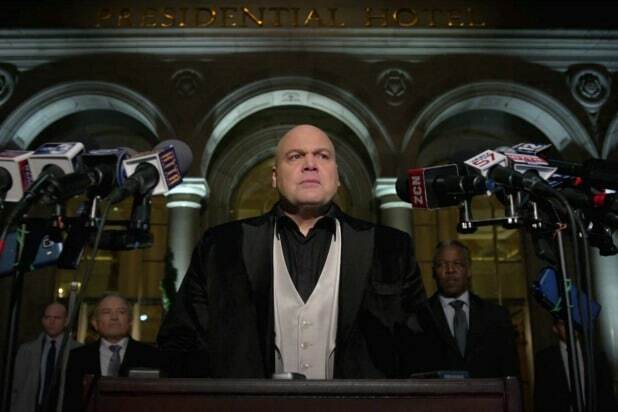 The immediate context is that Fisk’s legal team manages to have his criminal conviction from the end of “Daredevil” Season 2 thrown out on appeal, making him officially a free man. And he gives this speech in his first public appearance after that decision. You can see the Trump-style rhetoric in the speech — complaining about the media (fake news), claiming that the establishment doesn’t like him because he tells it like it is (drain the swamp! ), blaming other people for something he did (for example). If he’d have ended his comments by yelling “Lock him up!” it wouldn’t have felt out of place. So if you don’t want to know any more about what Fisk is talking about there, now would be a good time to leave. The greater context is pretty interesting, though, given the parallel I’m drawing between Fisk and Trump. 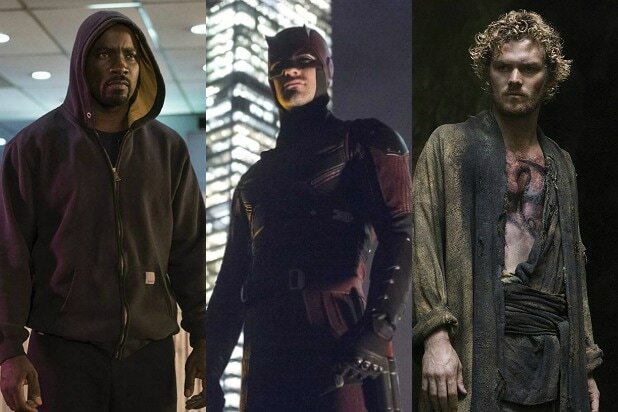 Anyway, what’s been happening in “Daredevil” Season 3 up to that point is that Fisk has been sending out a corrupt FBI agent named Benjamin Poindexter (Wilson Bethel), who will become the villain Bullseye, dressed in Daredevil’s suit to do evil villain things in order to both slander Daredevil’s good name and eliminate threats to Fisk’s cartel. At one point he assaults the office of the New York Bulletin to murder a guy who Fisk paid to shank him so he could be taken out of prison and into protective custody — if you’re keeping track, that’s the Kingpin using one false flag operation to cover up a different false flag. If you want to watch the speech for yourself, you can head to Netflix, pull up “Daredevil” Season 3, Episode 11, and queue it up to the 15:30 mark. If you’re logged into Netflix in the Chrome browser or a mobile device, you can simply click this link and it will take you to that scene directly.